Bachkovo Monastery in Rodope mountain in Bulgaria. 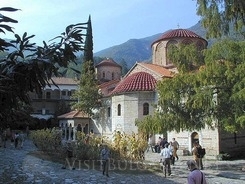 The “Assumption” monastery is the second large monastery in Bulgaria. It is situated in the western part of Rodope Mountain 10 km away from Asenovgrad. It was founded by Grigoriy Bukuriani – Georgian military commander who was at the service of the Byzantine Emperor. After the Ottomans conquered Bulgaria in the end of 14 century the heroic patriarch St. Evtimiy Tarnovski was send into exile in the monastery, were he stayed until the end of the life. He was buried here. At first the monastery survived after the ottomans attacks but later it was burned down and plundered. During the 15th century it was renovated, and the main monastery church was built in 1604. The wall paintings in the refectory date back from 1643 and they are of great art value. There are stages of “the Doomsday”, figures of holly monks, stages from the Orthodox Church history and many other mural paintings. The icon of Virgin Mary is very attractive too. It is said that the icon is miraculous. 103 manuscripts and 252 old printed books were found in the monastery in the beginning of 20 century and were called “a real literature depository”.